As an avid Michael Cunningham devotee and a modest Walt Whitman scholar, I was more than a little curious about the latest literary endeavor of the widely acclaimed author of The Hours. Specimen Days, a novel in three parts, grandly presents to the reader, New York City. Through a series of dramatic flashes connected by a subtly prophetic thread, Cunningham boldly commandeers our fabled and factual voyage from the harrowing birth of the American Industrial Age to a time one-hundred and fifty years from the present, when the New York we know is only barely recognizable through the eyes of robots engaged in the act of make believe, pantomiming the familiarities of a city that once was king. In the first tale, “In the Machine,” we are entranced and fascinated by the eidolic imagery used to paint a picture of Lucas, a deformed boy of thirteen who spews passages from Whitman’s Leaves of Grass intermittently with his own words. We enter his life just after his family has been rocked by the death of his brother Simon. Killed by a machine in the Ironworks, Simon has left behind his lovely intended, Catherine, who is to Lucas, an angel on earth. As we are plunged more deeply into the horror that is life below the poverty line of 19th century New York, we come to see beyond the harshness of child labor, crippling illness and lunacy. We are instead urged to contemplate a peripheral threat, one hovering like a grim lullaby, easing into our collective unconscious, and striking us with its sharp edged reality. The second section, “The Children’s Crusade,” is not as skillfully rendered. In its weakest moments, it struck me as an easily fleshed out crime novel, the dialogue of which one could indubitably find between the creased covers of a Dean Koontz thriller. Set in present day New York, the portrait of police life in a terrorist laden city seems to be slightly unfamiliar terrain for Cunningham. He struggles to accurately depict his main character, Cat; the brash, commitment phobic and almost offensively stereotypical female African American cop. The saving grace of “The Children’s Crusade” is the ending, which manages to transcend the banal plot and hollow characterization with a welcome evocation of Cunningham’s innate and pure talent. “Like Beauty,” Cunningham’s alien fraught futuristic finale is, ironically, devoid of any semblance of imaginative writing. Though the subject matter, the future of New York City, is completely unknown and therefore ideal for fresh and innovative philosophies, Cunningham’s vision is burdened with disappointing predictability in the form of green aliens and ridiculous electronic technology. Brave New World this is not. Perhaps most disappointing is that the connections between the sections, such as name repetition, the reappearance of a mysterious object, and most obviously, Walt Whitman himself, turn out to be fruitless. 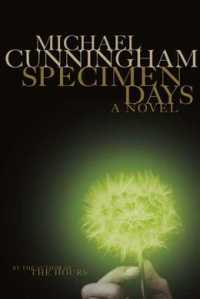 In the 19th century Whitman published a book of his observations, Specimen Days, and perhaps because of this, the reader of Cunningham’s novel seeks some greater point to harness: brilliant commentary, poetic passion, or even a plausible set of predictions. Despite all of my negative thoughts on this novel, the first section is quite moving and lovely. I’d still recommend it to any fan of Cunningham, or, failing that, Dean Koontz.